Richard Stockton was a lawyer, jurist, legislator, and one of the signers of the Declaration of Independence. Disinterested in politics, he once wrote, "The publick is generally unthankful, and I never will become a Servant of it, till I am convinced that by neglecting my own affairs I am doing more acceptable Service to God and Man." Later, however, he took an active role as a trustee of the College of New Jersey. In 1768 he was appointed to the governing Council of New Jersey. In 1774, he was appointed to the New Jersey Supreme Court. Initially, he took a moderate stance in the problems the colonies and Great Britain were experiencing. Rather than favoring separation, he suggested in 1764 that colonial members be appointed to the Parliament. He changed his position a year later when the Stamp Act became an issue, at which time he drafted and sent to Lord Dartmouth "a plan of self-government for America, independent of Parliament, without renouncing allegiance to the Crown." 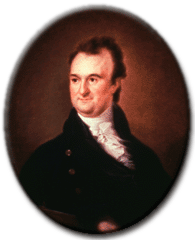 In 1776 Stockton was elected to the Continental Congress, where he took a very active role. Shortly after he signed the Declaration of Independence, he was taken prisoner by the British. Although he was in prison for only a month, his health suffered in the extreme. He became an invalid and died as a result of his mistreatment.